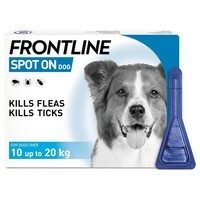 Frontline Spot On for Medium Dogs is for use in the treatment and prevention of infestations by fleas and ticks. Dosage 1 pipette of 1.34 ml per dog (approximately 7.5 - 15 mg/kg); follow the instructions on the packet for correct application. Best flea treatment on the market! My dog has not had a single flea on him since I've started using Frontline. The six pack is great. I defiantly trust this brand and completely swear by it. Highly recommend. Frontline works very well. I walk my Springer in the fields and so not have any flea issues. Excellent price and delivery. I used to use Frontline on my cat when she was alive and never had a problem with her especially as she had an allergy to flea bites. I have recently got my dog within the last 3 months and the first flea treatment I thought of was Frontline as I know it is very reliable. I used to buy these from the vets for my cat but it is much cheaper here and especially with the larger pack makes it cheaper too. As always I made the mistake of buying Frontline form the vets. It was during shopping for other doggy essentials that I realised I could buy it from here with out prescription for £10 less than my vets. Thank you! Have used Frontline on my dog for years and have never had a problem with fleas or ticks, even living in the countryside with a Springer that has to investigate everywhere. Have purchased from VetUK for years as they have the best price and great delivery times. Very good especially as it is now available without prescription. We've always used frontline on our dogs. We live in a rural area where livestock are kept including many sheep. Our dogs have never had a flea or tick infestation.